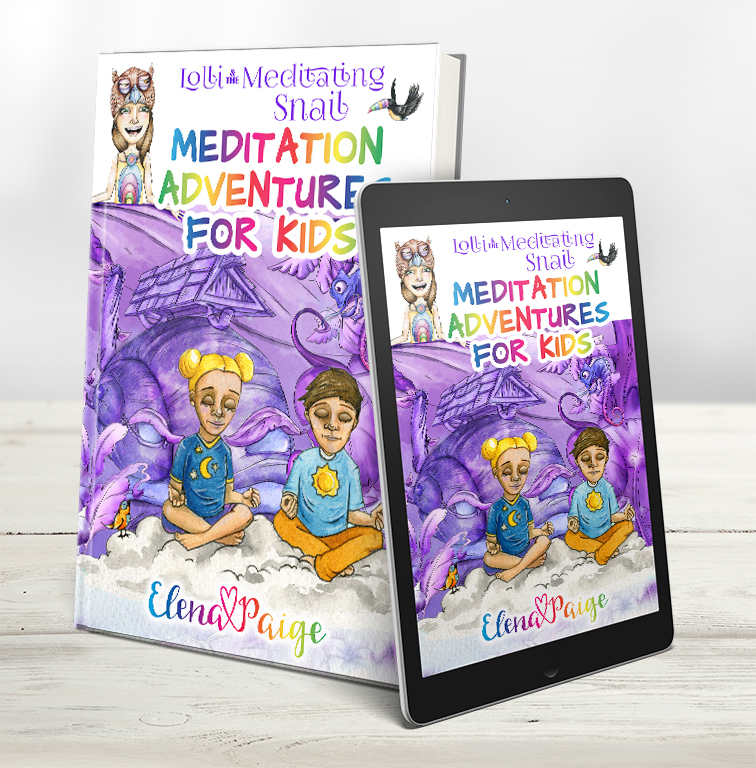 MEDITATION ADVENTURES FOR KIDS – Brand New Releases! It’s me Elena Paige today. I have been working really hard these past few months writing the next two books in the Meditation Adventures for Kids series. My own two children (now 10 and 12) are so helpful at helping me come up with the greatest fun and adventurous ideas to put into the meditations – after all, I want kids to read or hear them and transform, but also to have a great time. LOLLI AND THE TALKING BOOKS – This book features three new adventure meditations – Lolli and the Talking Books where you meet all the floating talking books at the highest clouds, and help a new book be born. Lolli and the Chocolate Tree where you discover where chocolate really comes from in Peru and meet Spike the Armadillo. And Lolli and the Wind Maze, where you must move successfully through the maze without the dangerous wind affecting you and help new character’s Bear girl and Charity boy that will feature in their very own mystery series books next year (as soon as I can write them). LOLLI AND THE MEDITATING SNAIL – This book again offers three new and unique adventures – Lolli and the Meditating Snail, where you meet Fred the giant purple snail in Purple Land and he gives you a secret potion for your very own mind power. Lolli and the Food Fight, where you help heal the sick children in hospital then head on over to Fighting Land and have a giant food fight. And Lolli and the Traveling Circus where you watch a circus like no other. It features the real life Manehune Fairies from Hawaii, shy pythons, leprechauns, mermaids, crane birds and even a unicorn! The marketing world tells me definitely never to release two books on the same day, so sorry, I have broken the rules. Lolli is written with a love and passion for helping kids to succeed in life and most importantly to be happy. So I will release them as I write them. I’ve tried to help solve some new and interesting problems for kids in these books – how to help them concentrate more through feeling into their own body; helping friends and being brave; sharing and not being greedy; being generous with money; overcoming shyness and more. And the adventures in these two books have become even MORE adventurous, than in the original two books. They are even more like stories now and some have missions and an aim that your child is trying to achieve with Lolli. Also these two new books feature a NEW CHARACTER that is on the front cover of all the books, but was never formally introduced until now – LIQUORICE the talking toucan. The spelling within all the books is US, but I keep Liquorice’s name spelled the UK way, because he is such a unique character. He’s always terrified of everything, and is constantly falling asleep by the end of the meditation, but he ads some more fun for kids. Plus boys love, that he too is a boy! I hope you enjoy them. They are also now available in paperback and hardback which you can buy from Amazon, BookDepository and many other online vendors. You can now also go into your LOCAL LIBRARY and BOOK SHOP and request a copy of any book, and they can order it in for you. The same with any book store. You can now request the titles! Plus with Kindle Matchbooks, if you buy the paperback from Amazon, you get the ebook free. They will stay exclusive to Amazon for a while, so you can also read it free in Kindle Unlimited. I hope all else is going well, and if you have the time, I WOULD LOVE IT SO MUCH, if you could hit reply to this email and send me any ideas or problems your child is having that you would like the next LOLLI MEDITATIONS to address. All your ideas, or problems – I would love to hear them. Plus if your kids listen or read the meditations and say “I would love a boa constrictor in a meditation” pass that along to me too. I will be writing the next 5 books in the next few months and would love your kids’ suggestions! PS If you love any of the illustrations from the Lolli books and would love to order it on a t-shirt, stickers, mugs etc, let me know and I’ll organise it. You can see some of the images I have already uploaded here, ready for sale. My kids will be ordering some too. Henry the bunyip is from Lolli &the Bunyip, not yet released, and my kids love him best so far! Here is the link for the online shop at RedBubble.